Harvard netminder Lindsay Reed totaled 73 saves in the double-header this past weekend. Returning back to the ice after an extended winter break, the Harvard women’s ice hockey team fell to two in-conference opponents in Quinnipiac and Princeton this past weekend. Limited to just 13 players dressed for play, the Crimson looks forward to the return of star freshman Dominique Petrie, who is currently away from the team captaining the U.S. U-18 women’s national side. With only 24 hours of turnaround following the Princeton contest, Harvard hit the ice again for a matchup with another ECAC foe in Quinnipiac. The Bobcats (7-11-3, 6-5-1 ECAC) came into the matchup with momentum, having defeated the Big Green of Dartmouth by a sound 5-1 margin on Friday night. Despite Quinnipiac’s recent high-powered display of offense, the Crimson locked down the Cats, holding them to one goal as freshman goalie Lindsay Reed led the defensive effort with a 32-save performance. That being said, while the Quinnipiac found the back of the net in the middle of the third period, Harvard could not capitalize on any offensive chances, and the Crimson fell in a 1-0 decision. As the first 45 minutes of the game time ticked away without a goal from either side, the teams remained deadlocked in more than just the scoreline. Quinnipiac held slim advantages over Harvard in shots on goal (33-28) and blocked shots (17-13), but the Crimson returned the favor by edging the Bobcats 33-31 in faceoffs won. Both teams only had one power play opportunity as the two squads almost escaped the game without having to go the box. Dealing with injuries, staying disciplined was especially important for Harvard as the Crimson played only 13 skaters on the afternoon compared to the Bobcats’ 18. Most significantly, only four Crimson defenders split up the defensive workload, so any time spent in the box could prove to be critical. Harvard did rally around its limited numbers, but the short bench still proved to be a major challenge. 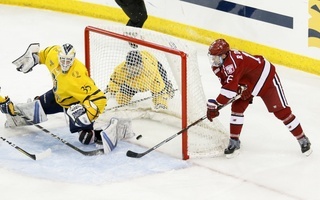 The two teams continued to lock each other down on defense, with Harvard matching Quinnipiac despite the numbers discrepancy. Defense prevailed, and the team that scored first would have a great chance to ice the game with even just one tally. “We talked about it before the game that we wanted to pin the puck along the boards and stop plays when we could instead of letting the [other] team have momentum in the offensive zone,” Fusco said. Despite Harvard’s inspired, shorthanded effort to thwart Quinnipiac, the Bobcats found a breakthrough. 6:16 into the final frame, the difference in the game unfolded as Quinnipiac senior forward Melissa Samoskevich found her way to a loose puck and buried the ensuing chance to put the Bobcats up 1-0. After Quinnipiac pulled ahead, the Crimson scrapped on the offensive side of the ice in the third period to try to even the scoreline. Over the last stanza, Harvard outshot the Bobcats 14-10. With two minutes remaining, the Crimson pulled Reed for an extra skater. With 37 seconds left on the clock, Harvard had perhaps its best scoring opportunity of the game as Quinnipiac took a two-minute minor penalty for checking. Despite Harvard’s flurry of chances on the two-skater advantage, the Crimson could not crack the Bobcat defense. In the final seconds of the game, Quinnipiac rallied to block three Harvard power-play shots before they even reached the net. Also, being on the penalty kill, the Bobcats could ice the puck without a whistle and aim for the empty net, presenting a unique challenge. The Bobcats complemented scrappy shot-blocking with goaltending as Quinnipiac junior goalie Abbie Ives was resolute throughout the game, posting a 28-save shutout by the time the final buzzer rang. The 1-0 score held as the final, and Harvard dropped to 4-8-2 on the season with a 3-5-1 mark in the ECAC. Princeton handed the Crimson its first loss of 2019 in a meetup on Friday at the Bright-Landry Hockey Center characterized by strong defensive performances from both sides for large portions of the game. However, a four-minute spate of offensive fire from the No. 6/6 Tigers (12-2-4, 10-0-2 ECAC) broke the game wide open at the tail end of the second period. The visitors gained their first lead of the game against a shorthanded Harvard side with 4:53 left in the second period. A series of Princeton passes on Crimson ice eventually delivered the puck to freshman forward Maggie Connors, who swiftly settled, shot, and scored. Despite Harvard’s return to full strength, the Tigers were just getting started. A similar back-and-forth series 38 seconds later put the puck on sophomore forward Shannon Griffin’s stick, who fired past the posts to put Princeton up 3-1. Three minutes later, Connors scored another power play goal. “Overall, we played well, we just let five minutes get away from us, which is not what we want to do,” Fusco said. 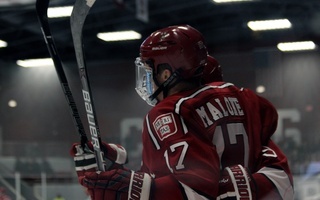 Barring those final five minutes of the second period, the Crimson held its own against the Tigers, who entered riding a 14-game unbeaten streak. Coming off a nearly month-long break due to reading period, final exams, and end-of-the-year holidays, Harvard took the ice with zeal. “I think we had a lot of energy coming into the game, and we were excited to play after coming off a long break,” Fusco said. Ten minutes after the puck dropped, a Crimson power play gave Harvard what it needed. A whack from the blue line by junior defender Ali Peper sailed by the Princeton goalie to give the Crimson a 1-0 lead. Two minutes later, another Tigers penalty offered Harvard an opportunity to pull away. Then, the puck found Princeton freshman forward Sarah Fillier. The ECAC Rookie of the Month maneuvered down the ice and flicked one by freshman goalie Lindsay Reed for the Tigers’ second short-handed goal of the season. The power play expired, and the remainder of the first elapsed with no clear leader, both sides trading shots. The second began as the first ended — frequent puck motion and changes in possession, but no changes in score. Stellar netminding by Reed saw 19 saves, including a behind-the-back kick eight minutes in, before Princeton’s second goal of the game marked the start of the fateful four minutes. After the close of the second, the Crimson regrouped and entered the third with renewed vigor. 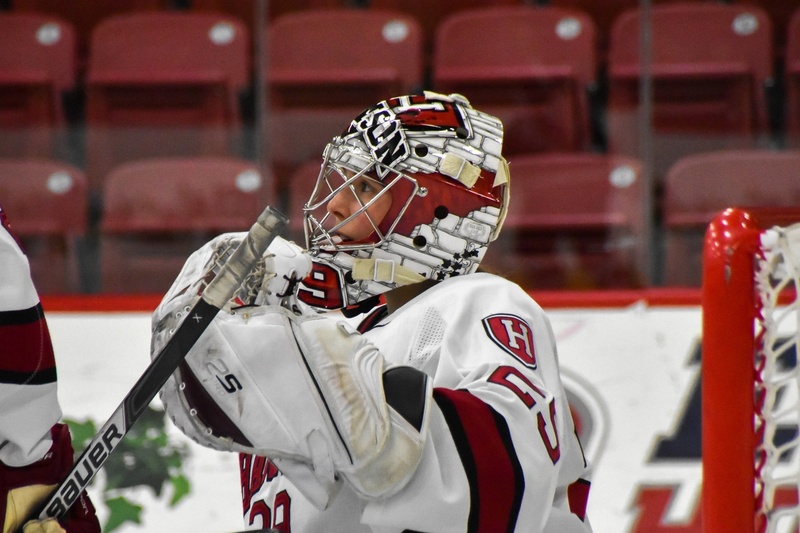 Reed, whose save percentage is first in the ECAC and second in the nation, notched nine more saves while allowing no goals, but Harvard was also unable to score. “I think in the third period, we were able to match with them again, and kind of get back into our game,” Hughes said. In spite of the lopsided score, the Crimson saw promise in its first game of the year. Facing injuries and other absences, Harvard hopes to return to the win column with a more complete squad. — Staff writer William Boggs can be reached at william.boggs@thecrimson.com. — Staff writer Connor Wagaman can be reached at connor.wagaman@thecrimson.com. The No. 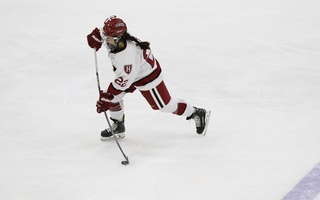 7 Harvard women's hockey team easily dispatched host Quinnipiac, 6-1, at the Northford Ice Pavilion on Friday night.